The aims of this study were to investigate the impact of Soybean Isoflavones (SIFs) on the cellular oxidative stress levels in hormone-sensitive type (LNCap) and hormone-insensitive type (DU145) of prostate cancer, and to elucidate the main components and their roles in the transformation of Androgen Dependency (AD)/Androgen Independency (AI). The LNCap and DU145 cells were treated with different concentrations of SIFs monomer (including daidzin, genistin, daidzein, and genistein), and the activities of Superoxide Dismutase (SOD) and Malondialdehyde (MDA) were then measured. The content of Reactive Oxygen Species (ROS) in these two cells was also determined after treated with certain effective monomer. The contents of MDA in the two kinds of cells treated with genistein and daidzein were increased, but the contents of SOD were decreased in a concentration-dependent manner. There was no significant difference between daidzin and genistin. The content of MDA in the DU145 cells was higher than that in the LNCap cells under the same conditions, but the content of SOD was decreased, indicating that the oxidative stress level in DU-145 was higher than LNCap, and the ROS level in DU145 treated with effective component was significantly higher than that in LNCap. Genistein and daidzein in SIFs can affect the apoptosis and proliferation of prostate cancer cells through increasing their oxidative stress levels, thus inhibit the transformation of prostate cancer toward androgen-independent type. As the most common malignancy in male urinary system, the global incidence rate of Prostate Cancer (PCa) has increased significantly in near 20 years . A large number of studies have shown that the risk of PCa in males in Asian countries is significantly lower than in Western countries , which also have significant ethnic and regional differences. However, after immigrated to Western countries or took the Western way of life, the incidence of PCa in Asian populations has increased significantly , which shows that in addition to genetic factors, dietary compositions and living environments may affect the occurrence and development of PCa. Numerous studies have shown that the intake of soy, one of the main dietary components of Asians, is inversely proportional to the risk of PCa . Androgen blockade therapy is the most effective treatment for the patients with advanced PCa, but after about 18 to 24 months of treatment , many patients will gradually progress from androgen-dependency to androgen-independency, at which time androgen blockade treatment is no longer effective toward PCa, and PCa thus becomes Castration Resistant Prostate Cancer (CRPC). Currently, there still lacks effective treatment toward CRPC. Through our large number of clinical work, we find that the probability of the PCa patients with long-term soybean meal into CRPC is reduced to 44.7%, and the average conversion period is extended to 37 months. Soybean isoflavones are a kind of flavonoids widely distributed in leguminous plants, mainly including daidzin, daidzein, genistin, genistein, glycitein, orglycitin, among which genistein and daidzein are more investigated recently. As the main active ingredients in confronting PCa , the main anti-cancer mechanisms of SIFs involve: 1. can negatively regulate the androgen; 2. can regulate the cell cycle, regulate such signal pathways as IGF-1, TGF-β, and Wnt/β-catenin, or inhibit tyrosine kinase activity , thus inhibiting the proliferation of cancer cells; 3. can induce the apoptosis of cancer cells; 4. can induce the autophagy, antioxidant defense, and DNA repair mechanism; 5. can regulate DNA methylation, modify histone, and regulate miRNA; 6. Can inhibit the DNA topoisomerase I and II, and aromatase; 7. Can inhibit the angiogenesis and metastasis in PCa [7-9]. Our pre-epidemiological study has found that the probability of PCa transforming from hormonedependency to hormone-independency in the PCa patients with long-term postoperative dietary soy products can be significantly reduced. Meanwhile, the comparison of AD- and AI-type PCa tissue before and after long-term dietary intake of soy products reveals that the level of oxidative stress (reactive oxygen species and reactive nitrogens) in AI-type PCa tissue is significantly increased, together the contents of such oxidative stress products as MDA and 4-HNE in the serum and urine of PCa patients are significantly reduced, suggesting that oxidative stress may participate in the AD/AI transformation of PCa. Previous studies have shown that the antioxidant properties of SIFs play an important role in a variety of chronic diseases such as cardiovascular diseases, kidney diseases, or diabetes mellitus [10,11]. Interestingly, studies also have shown that SIFs play the role of antioxidation as well as promote the oxidative stress [12,13], and this mainly depends on the experimental environments. In this study, we investigated the in vitro effects of SIFs on the oxidative stress levels in AD- and AI-type PCa cell lines, and identified the main components of SIFs that can affect the oxidative stress, and further confirmed the roles of SIFs in the AD/AI conversion of PCa, hoping to provide new possibilities for the disease control of PCa as well as for the development of individualized therapeutic drugs for CRPC. The LNCap cells and the DU-145 cells (Cell Bank of Type Culture Collection Committee, Chinese Academic Science, Shanghai, China) were inoculated in 10%-FBS (Gibco, Shanghai, China) -containing RMPI-1640 medium (Nanjing Keygen Bio Tech Inc., Nanjing, China) (100 U/ml penicillin and 100 μg/ml streptomycin) and incubated in an incubator with 5% CO2 and saturated humidity at 37°C. The LNCap and DU-145 cells in logarithmic growth phase were separately into 96-well plates; the study set the blank control group (cell-free 100 μL of culture medium for zero adjustment), the control group (untreated cells), and the experimental groups (with different concentrations of H2O2). The latter two groups were added 100 μL of the cells (5 × 104/ml) and incubated in 5% CO2 at 37°C. After 24-culture, H2O2 was added into the wells of the experimental groups with the final concentration as 25 μmol/L, 50 μmol/L, 100 μmol/L, 200 μmol/L, 400 μmol/L, 600 μmol/L, 800 μmol/L, and 1000 μmol/L, respectively, and the final concentration of the solution was 200 μL. After 12 h incubation in 5% CO2 at 37°C, 10 μL of CCK-8 reagent (Nanjing Keygen BioTech Inc., Nanjing, China) was added to each well, followed by 2 h incubation at 37°C. The OD values of the wells were measured at 450 nm. The test was repeated 3 times for the average. The appropriate concentration of H2O2 was used to construct the oxidative stress model of PCa cell line. The cells in logarithmic growth phase were incubated into cells flasks, and the groups were set as the following: the normal control group, the SIF monomer-treatment groups (including Daidzin, Genistin, Daidzein, and Genistein) (Gibco, Shanghai, China) (concentrations of SIF monomer: 5 μM, 25 μM, 50 μM, and 100 μM, respectively), the H2O2-treatment group (200 μM), the SIF monomer (5 μM, 25 μM, 50 μM, and 100 μM, respectively)+H2O2 (200 μM)-treatment groups; the treatment periods of SIF monomer were 24 h and the treatment periods of H2O2 were 12 h, respectively. At the end of the intervention, the SOD and MDA levels were detected according to the kit instructions (Nanjing Keygen BioTech Inc., Nanjing, China). The cells in logarithmic growth phase were incubated into cells flasks, and the groups were set as the following: the normal control group, the SIF monomer-treatment groups (concentrations of SIF monomer: 5 μM, 25 μM, 50 μM, and 100 μM, respectively). The ROS level was detected by flow cytometry (Nanjing Keygen BioTech Inc., Nanjing, China), and the fluorescence intensity was analysed using laser confocal scanning microscopy. SPSS17.0 and Excel were used for the analysis, the analysis of variance and the t test were used to determine whether the difference was significant, with P<0.05 considered as significant difference. After the LNCap cells and the DU-145 cells were treated with different concentrations of H2O2 (25~1000 μM) for 12 h, the cell viability was detected by the CCK-8 method. The results showed that: (Figure 1A) 0~50 μM H2O2 treatment had no significant effect on the LNCap cells, but the cell viability was significantly decreased after treatment with 50~1000 μM H2O2, showing significant difference than the control group; the IC50 concentration was 261.76 μM. (Figure 1B) 0~25 μM H2O2 treatment had no significant effect on the DU-145 cells, but the cell viability was significantly decreased after treatment with 50~1000 μM H2O2, showing significant difference than the control group; IC50 concentration was 225.14 μM. After combined the performance of the two cells, the appropriate concentration of H2O2 was determined to be about 200 μM. Figure 1. A. Effects of H2O2 on the viability of LNCap cells. B. Effects of H2O2 on the viability of DU145 cells. The LNCap cells were treated with different concentrations of SIF monomers in the presence or absence of H2O2 for 24 h, followed by detecting the contents of SOD and MDA. The results of MDA (Figure 2) showed that LNCap cells treated with 5 μm genistein/daidzein showed no obvious change compared to the control group, but those treated with 25~100 μm genistein/daidzein showed significantly increased MDA content in a concentration-dependent manner. The LNCap cells treated with most concentrations of daidzin and genistin showed no significant difference, only 50~100 μm genistin showed slightly difference. The results of SOD (Figure 3) showed that LNCap cells treated with 5 μm genistein/daidzein showed slightly difference compared to the control group, but those treated with 25~100 μm genistein/daidzein showed significantly decreased SOD content in a concentration-dependent manner. The LNCap cells treated with different concentrations of daidzin and genistin showed no significant difference. Figure 2. A. Detection of MDA in the daidzein-treated LNCap cells. B. Detection of MDA in the daidzin-treated LNCap cells. C. Detection of MDA in the genistein-treated LNCap cells. D. Detection of MDA in the genistin-treated LNCap cells. (N=5, *Compared to the blank control group, P<0.05; **Compared to the H2O2 (200 μM)-treated control group, P<0.05). Figure 3. A. Detection of SOD in the daidzein-treated LNCap cells. B. Detection of SOD in the daidzin-treated LNCap cells. C. Detection of SOD in the genistein-treated LNCap cells. D. Detection of SOD in the genistin-treated LNCap cells. (N=5, *Compared to the blank control group, P<0.05; **Compared to the H2O2 (200 μM)-treated control group, P<0.05). The DU145 cells were treated with different concentrations of SIF monomers in the presence or absence of H2O2 for 24 h, followed by detecting the contents of SOD and MDA. 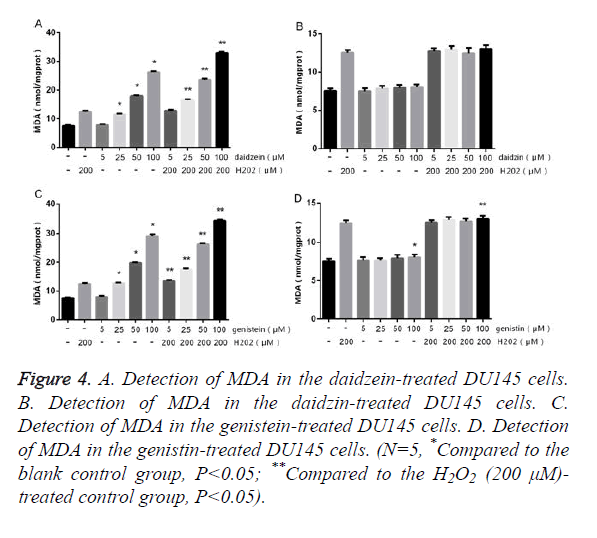 The results of MDA (Figure 4) showed that DU145 cells treated with 5 μm genistein/daidzein showed no obvious change compared to the control group, but those treated with 25~100 μm genistein/daidzein showed significantly increased MDA content in a concentration-dependent manner. The DU145 cells treated with most concentrations of daidzin and genistin showed no significant difference, only 100 μm genistin showed slightly difference. 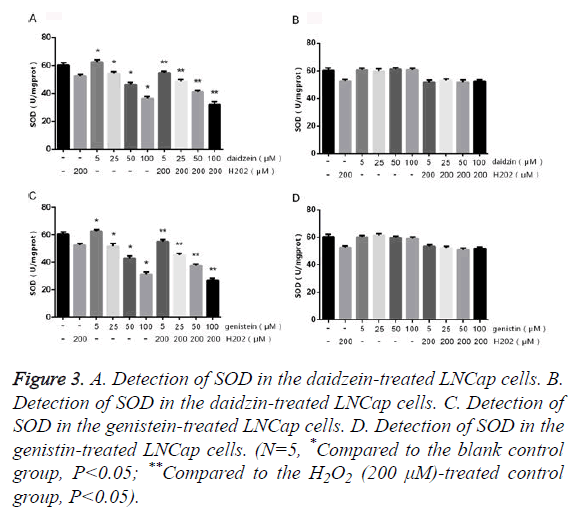 The results of SOD (Figure 5) showed that LNCap cells treated with 5 μm genistein/daidzein showed no significant difference compared to the control group, but those treated with 25~100 μm genistein/daidzein showed significantly decreased SOD content in a concentrationdependent manner. The LNCap cells treated with different concentrations of daidzin and genistin showed no significant difference. The comparison of Figures 2 and 4 or Figures 3 and 5 showed that: under the same treatment conditions, the oxidative stress level in the DU145 cells was significantly higher than in the LNCap cells, indicating that AI-PCa is in a higher oxidation status. Figure 4. A. Detection of MDA in the daidzein-treated DU145 cells. B. Detection of MDA in the daidzin-treated DU145 cells. C. Detection of MDA in the genistein-treated DU145 cells. D. Detection of MDA in the genistin-treated DU145 cells. (N=5, *Compared to the blank control group, P<0.05; **Compared to the H2O2 (200 μM)- treated control group, P<0.05). Figure 5. A. 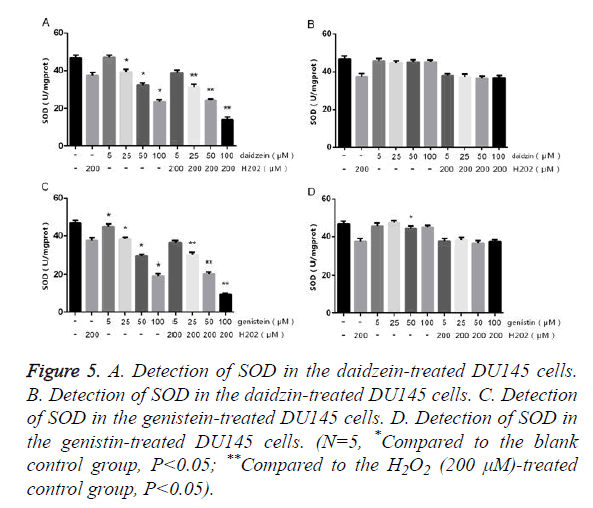 Detection of SOD in the daidzein-treated DU145 cells. B. Detection of SOD in the daidzin-treated DU145 cells. C. Detection of SOD in the genistein-treated DU145 cells. D. Detection of SOD in the genistin-treated DU145 cells. (N=5, *Compared to the blank control group, P<0.05; **Compared to the H2O2 (200 μM)-treated control group, P<0.05). As can be seen from Figures 2-5, the main effective components of SIFs are genistein and daidzein. After treated the LNCap cells and the DU-145 cells with different concentrations of genistein and daidzein. The results (Tables 1 and 2) showed that the intracellular ROS level was significantly increased in a concentration-dependent manner. Under the same conditions, the ROS level in the DU145 cells was statistically significantly higher than that in the LNCap cells. Table 1. Determination of ROS levels in LNCap and DU-145 treated with different concentrations of daidzein (%). Table 2. Determination of ROS levels in LNCap and DU-145 treated with different concentrations of genistein (%). SIFs have attracted wide attention due to their anti-cancer properties, and their anti-cancer mechanisms have become a research hotspot. However, the specific anti-cancer mechanisms are still not fully understood thoroughly, among which SIFs’ roles in regulating the oxidative stress may be one of the mechanisms about the anti-cancer activities. We confirm by determining the lipid peroxidation, antioxidant enzymes, and intracellular ROS content of PCa cells that: SIFs play a significant pro-oxidation role in PCa, which is also reported in breast cancer cells [14,15]. Although the antioxidant properties of SIFs in the cardiovascular system and other chronic diseases have been generally recognized, under certain conditions, still exists potential pro-oxidation characteristics. As for the field of antitumor, its pro-oxidation effect may be more important than its antioxidant effect. Many mechanisms of pro-oxidation in confronting tumors have been proposed, including intracellular metal ions (CU2+) mediated pro-oxidation , intracellular ROS-mediated pro-oxidative cytotoxicity , phenol radicals/ Phenol redox complex , the mitochondrial pathwaymediated apoptosis , etc. Compared to normal cells, the redox system of tumor cells has lost balance, and the cells are in a sustained oxidative stress state, the antioxidant defense capacity of which has been significantly reduced than normal cells. Moreover, because tumor cells grow faster had higher level of metabolism, tumor cells are more likely to produce and accumulate a large number of ROS. On one hand, tumor cells are prone to appearing irreversible damage and apoptosis when further oxidative damage exerts on the tumor cells and beyond their antioxidant threshold; on the other hand, excessive ROS itself may also act as a signaling molecule and participate in regulating the initiation and transduction of a series of apoptosis pathways . In addition, a large number of experiments have confirmed that the levels of copper ions in the cells, tissues, and plasma of a variety of malignancies were significantly higher than normal cells . SIFs can induce endogenous Cu2+ metabolic pathways, thus promoting DNA to occur fragmentation  and produce ROS [23,24], as well as leading to cell death finally. Normal cells can tolerate such strike due to their low basic ROS, Cu2+ level, and good antioxidant defense capability. These results could explain the inhibitory effects of SIFs on the proliferation of tumor cells and the pro-apoptosis effects of tumor cells in a dosedependent manner. In the present study, genistin and daidzein-treated LNCap cells and DU-145 cells exhibited significantly increased ROS and MDA, but the content of SOD was significantly decreased, which became more obvious with the increase of concentrations. Moreover, under the same conditions, the DU-145 cells had higher ROS level than the LNCap cells, suggesting that SIFs can induce the apoptosis and death of tumor cells by promoting the oxidative stress level of tumor cells, and such effects are much stronger toward AI PCa cells than AD PCa cells. In summary, SIFs can promote the increase of oxidative stress level in PCa cells, thus affecting the occurrence of cell apoptosis and proliferation and inhibiting the transformation of PCa from hormone-dependency to hormone-independency. Such results suggest that SIFs have potential treatment values toward CRPC. However, our current study has not involved in the mechanism at the molecular level yet; therefore, further studies are necessary so as to identify the specific molecular mechanisms of SIFs, which can make us much more thoroughly understand the inhibitory mechanism of SIFs in preventing the AI transformation of PCa, and may provide further theoretical basis for the treatment of CRPC. This study was supported by the 11th-batch of high-level personnel training and funding projects of "six talent peaks", Jiangsu, 2014. Plata BA, Concepcion MT. Prostate cancer epidemiology. Arch Esp Urol 2014; 67: 37382. Hassanipour AS, Mohammadian HA, Ghoncheh M, Towhidi F, Jamehshorani S, Salehiniya H. Incidence and mortality of prostate cancer and their relationship with the Human Development Index worldwide. Prostate Int 2016; 4: 118-124. Kimura T. East meets West: ethnic differences in prostate cancer epidemiology between East Asians and Caucasians. Chin J Cancer 2012; 31: 421-429. Hwang YW, Kim SY, Jee SH, Kim YN, Nam CM. Soy food consumption and risk of prostate cancer: a meta-analysis of observational studies. Nutr Cancer 2009; 61: 598-606. Climent MA, Leon-Mateos L, Gonzalez Del Alba A, Perez-Valderrama B, Mendez-Vidal MJ, Mellado B, Arranz JA, Sanchez-Hernández A, Cassinello J, Olmos D, Carles J. Updated recommendations from the Spanish Oncology Genitourinary Group for the treatment of patients with metastatic castration-resistant prostate cancer. Crit Rev Oncol Hematol 2015; 96: 308-318. Ahmad A, Biersack B, Li Y, Bao B, Kong D. Perspectives on the role of isoflavones in prostate cancer. AAPS J 2013; 15: 991-1000. Zhang HY, Cui J, Zhang Y, Wang ZL, Chong T. Isoflavones and Prostate Cancer: A Review of Some Critical Issues. Chin Med J (Engl) 2016; 129: 341-347. Karsli-Ceppioglu S, Ngollo M, Judes G, Penault-LLorca F, Bignon YJ. The role of soy phytoestrogens on genetic and epigenetic mechanisms of prostate cancer. Enzymes 2015; 37: 193-221. Mahmoud AM, Yang W, Bosland MC. Soy isoflavones and prostate cancer: a review of molecular mechanisms. J Steroid Biochem Mol Biol 2014; 140: 116-132. Rahman Mazumder MA, Hongsprabhas P. Genistein as antioxidant and antibrowning agents in in vivo and in vitro: A review. Biomed Pharmacother 2016; 82: 379-392. Jin L, Zhao X, Qin Y, Zhu W, Zhang W. Soy isoflavones protect against H2O2-induced injury in human umbilical vein endothelial cells. Mol Med Rep 2015; 12: 4476-4482. Ullah MF, Ahmad A, Bhat SH, Khan HY, Zubair H, Sarkar FH, Hadi SM. Simulating hypoxia-induced acidic environment in cancer cells facilitates mobilization and redox-cycling of genomic copper by daidzein leading to pro-oxidant cell death: implications for the sensitization of resistant hypoxic cancer cells to therapeutic challenges. Biometals 2016; 29: 299-310. Chen W, Lin YC, Ma XY, Jiang ZY, Lan SP. High concentrations of genistein exhibit pro-oxidant effects in primary muscle cells through mechanisms involving 5-lipoxygenase-mediated production of reactive oxygen species. Food Chem Toxicol 2014; 67: 72-79. Ullah MF, Ahmad A, Khan HY, Zubair H, Sarkar FH, Hadi SM. The prooxidant action of dietary antioxidants leading to cellular DNA breakage and anticancer effects: implications for chemotherapeutic action against cancer. Cell Biochem Biophys 2013; 67: 431-438. Ullah MF, Ahmad A, Zubair H, Khan HY, Wang Z, Sarkar FH, Hadi SM. Soy isoflavone genistein induces cell death in breast cancer cells through mobilization of endogenous copper ions and generation of reactive oxygen species. Mol Nutr Food Res 2011; 55: 553-559. Sakihama Y, Cohen MF, Grace SC, Yamasaki H. Plant phenolic antioxidant and prooxidant activities: phenolics-induced oxidative damage mediated by metals in plants. Toxicology 2002; 177: 67-80. Fujisawa S, Atsumi T, Ishihara M, Kadoma Y. Cytotoxicity, ROS-generation activity and radical-scavenging activity of curcumin and related compounds. Anticancer Res 2004; 24: 563-569. Nemeikaite-Ceniene A, Imbrasaite A, Sergediene E, Cenas N. Quantitative structure-activity relationships in prooxidant cytotoxicity of polyphenols: role of potential of phenoxyl radical/phenol redox couple. Arch Biochem Biophys 2005; 441: 182-190. Jin S, Zhang QY, Kang XM, Wang JX, Zhao WH. Daidzein induces MCF-7 breast cancer cell apoptosis via the mitochondrial pathway. Ann Oncol 2010; 21: 263-268. Yang Y, Deng S, Zeng Q, Hu W, Chen T. Highly stable selenadiazole derivatives induce bladder cancer cell apoptosis and inhibit cell migration and invasion through the activation of ROS-mediated signaling pathways. Dalton Trans 2016; 49: 1561-1568. Gupte A, Mumper RJ. Elevated copper and oxidative stress in cancer cells as a target for cancer treatment. Cancer Treat Rev 2009; 35: 32-46. Ullah MF, Shamim U, Hanif S, Azmi AS, Hadi SM. Cellular DNA breakage by soy isoflavone genistein and its methylated structural analogue biochanin A. Mol Nutr Food Res 2009; 53: 1376-1385. Khan HY, Zubair H, Ullah MF, Ahmad A, Hadi SM. A prooxidant mechanism for the anticancer and chemopreventive properties of plant polyphenols. Curr Drug Targets 2012; 13: 1738-1749. Khan HY, Zubair H, Faisal M, Ullah MF, Farhan M, Sarkar FH, Ahmad A, Hadi SM. Plant polyphenol induced cell death in human cancer cells involves mobilization of intracellular copper ions and reactive oxygen species generation: a mechanism for cancer chemopreventive action. Mol Nutr Food Res 2014; 58: 437-446.